I spent a good part of the weekend playing with my kits. Yesterday and today I worked on my SEI mother book from the project kit. 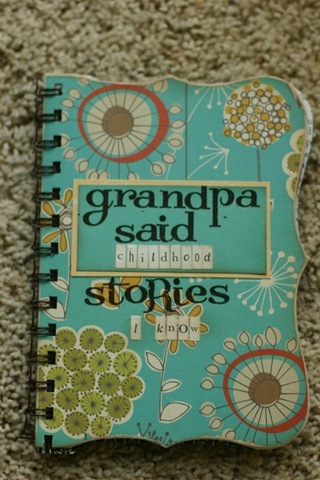 One of the things that inspired me today to start another mini was thinking about stories that my dad either shared with me, stories shared about my dad or just lessons and memories that I have. During our visit we talked about how our last name was changed (by something my father did as a child) and other fun stories and the more these thoughts, lessons and memories were in my head the more I realized I needed to get them on paper for my kids and their kids. This one is still a WORK IN PROGRESS from my Work in Progress main kit and project kit and my bind it all.